after a one year hiatus, beer is back at Gasparilla. last year, Miller brewing pulled out in the last minute, leaving a parade route with tons of people, beerless. well, essentially beerless to the fact that there was no beer being sold on the parade route. this did not mean you couldn’t bring your own! so anyway, this year, Budweiser has signed up as a sponsor for Gasparilla. 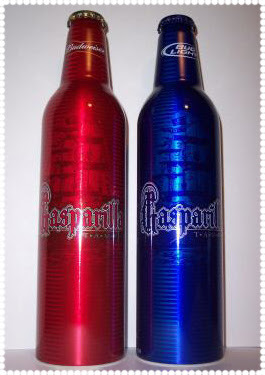 they have created a commemorative aluminum bottle for Budweiser and Bud Light. personally, I can’t stand either one of these choice beers, but I think it’s pretty cool to get the recognition of our Tampa parade by a beer company like Budweiser. too bad the aluminum can’t be put into our beer book.